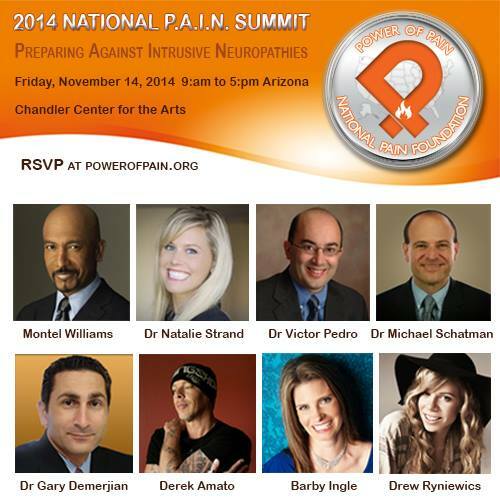 Power of Pain Foundation is hosting a charity event at the Chandler Center for the Arts on November 14, 2014. Please let your group members know about this great twofer event… 2 events, 1 date, 1 location. 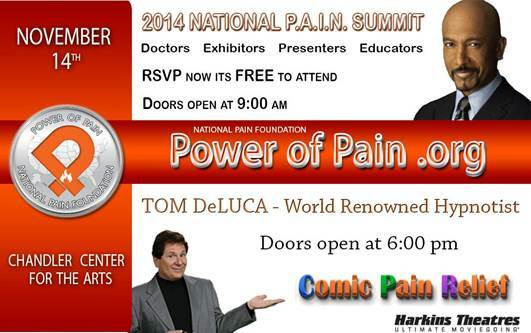 Comic Pain Relief featuring hypnotist, Tom DeLuca. Tickets at: http://chandlercenter.org/performances/1114.html#comic Doors open at 6pm Show starts at 7:30. Pre-event activities: Orange Carpet, Silent Auction, Patient Talent Showcase, display of the International RSD Awareness Quilt Project, Presentation of the Melanie McDowell Pain Awareness and Advocacy award and more. Tickets from $10. 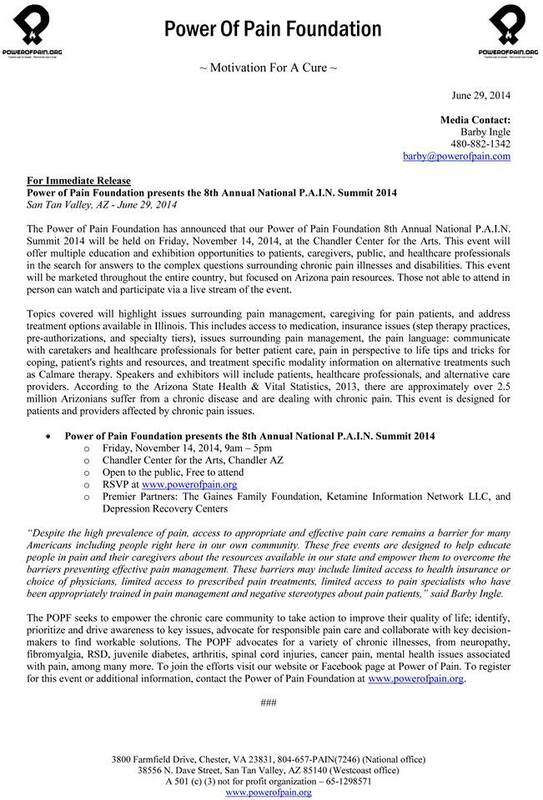 RSVP Required: http://painsummit2013.eventbrite.com/, Limited in-person space. Amazing Race, and WWE star and professional wrestler, Raven. Tagged Barby Ingle, Brittany Brannon Miss Arizona USA 2011 model and RSD patient, Chronic Pain, Diane Kennelly AZ Fibromyalgia Group Leader, Dr. Maged Hamza, Dr. Philip Getson DO, Dr. Tory McJunkin Arizona Pain Specialists, Hosted by the Power of Pain Foundation, Integratiive Approach to Chronic Pain by Dr. Philip Getson DO, Linda Watkins, Neuropathic Pain, P.A.I.N Summit Hosted by the Power of Pain Foundation, Power of Pain Foundation, Preventing complications that arise from diabetes such as peripheral neuropathy (pain) Dr. Natalie Stand MD Amazing Race Winner USC Pain Clinic, WWE star and professional wrestler Raven.